If you have ever had a crown placed over a tooth, you know how time-consuming it can be. The first trip to the dentist for a temporary, a second trip to have the permanent crown placed, and sometimes, a third and fourth trip if the crown doesn’t fit properly. What was once a two- or three-week waiting time has now been reduced to just one visit and less than two hours! With CEREC® technology, we can design and mill a perfectly fitting crown so there are no return trips to complete the process. CEREC® creates long-lasting, aesthetically pleasing restorations that are superior to plastic or metal fillings. The process starts by painting a reflective powder over the damaged tooth. With a special camera, we take a very accurate picture that is displayed on our computer screen so we may design the shape and size of the inlay, onlay, or crown. 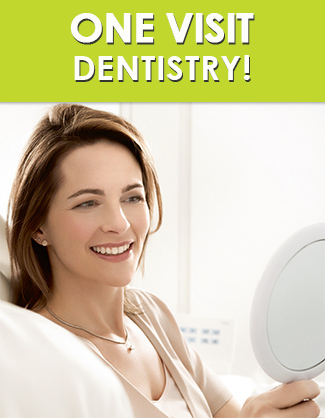 Automatically, CEREC® then creates the actual permanent restoration. It is ready for bonding to the tooth, and you may eat whatever you like once it is in place. What could possibly be easier than this high-tech procedure? There’s no charge to learn more about CEREC one-visit crowns. Call today at 763-972-2800 to schedule your complimentary consultation.